The Old City of Salamanca covers an ancient university town with groups of buildings in the Churrigueresque style. Salamanca lies in the heart of Spain, not far from Madrid. Besides two universities, the city has two cathedrals and a grand Plaza Mayor. The last was constructed in baroque style during the 18th century. The entrances to the Plaza are formed by impressive arches. 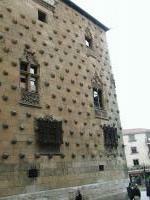 The Mansion Casa de las Conchas is another landmark of Salamanca. This 15th century house is decorated on the outside with 350 shells, as a symbol of the order of Saint James (where the owner was a member). 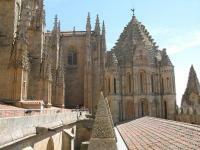 I stayed for 4 weeks in Salamanca, and like most people I did a Spanish course there. Classes were in the evening (16.30-20.30), so you had all day off. Most remarkable though were the (long) evenings and nights: late night dinner around 11 pm, and the rest of the night on the fabulous Plaza Mayor. Spain offers many pleasures to its visitors, but sitting on the terrace of a café on Salamanca's fantastic Plaza Mayor, enjoying tapas and a cold drink on a sunny autumn day while watching busy locals and hordes of picture-taking tourists pass by, is really hard to beat. The main square is but one of this great city's many attractions, which is equally famous for its venerable university, the historic part of which makes for a very interesting visit. As in many other Spanish cities, there is also a great cathedral (actually a joint complex of 2 separate churches) to admire, as well as a Roman bridge and many historic buildings scattered around the Old Town. This is where the purest form of Spanish is supposed to be spoken (accounting for the tens of thousands of foreigners in its language schools), the city where Columbus explained his plans to sceptic professors and clergymen a few months before his first voyage, and the city where Miguel de Cervantes, Lope de Vega, and Calderón de la Barca studied - and today a must-see for any visitor not only to Castile but to Spain. I visited this WHS in August 2003. Salamanca has one of the oldest universities in Europe but the highlight of my visit was the Plaza Mayor, with its impressive galleries and arcades. Other architectural gems in Salamanca that I visited are the Archbishop's (Irish)Palace (reached by bus #11 from the station), and the several Romanesque churches on the north and east sides of town. Especially interesting were the Sancti Spiritus church and the circular church of San Marco. Salamanca is most famous for its university, but it was its two cathedrals that impressed me the most. The interior of both, filled with tombs of old clergy and paintings, is nothing too special, but I would recommend the Ieronimus exhibition whose entrance is located at the side of the cathedral. It costs extra but is worth every penny. It allows you to go on top of the cathedrals and gives spectacular views of both the city and the cathedrals. My father and I visited this WHS on our last day in Spain. In addition to the university and cathedrals, we also stopped by the Roman bridge (nothing spectacular) and visited the church of San Esteban with its beautiful cloisters. A cursory look at the Plaza Mayor was also made. We had not originally planned to go to Salamanca, but we are glad we did. It would have been a tragedy to skip this place for a day of relaxation in Madrid. In 2000/2001 I was lucky enough to have the opportunity to study at La Universidad de Salamanca. Still to this date, nearly 3 years later it remains in the forefront of my mind. Salamanca is such a wonderful, magical city that you can just close your eyes and that's where you want to be. It still feel like home. The University is very prestigious and offers great courses, the people are so warm and friendly and the town itslef is just breathtaking. What more can a student want? The real question is not why should I go?, it's How can I possibly leave? Every day I still ask myself why I left after a year. 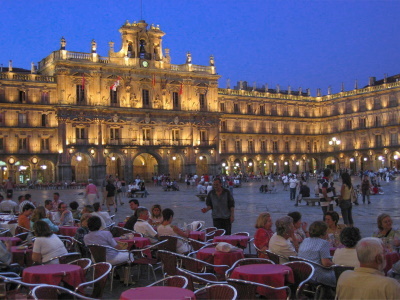 I would go back in a heartbeat, and so would all of you if you could just visit the wonderful city known as Salamanca. I am responding to the question about Salamanca. In 1986, I spent my Spring semester of college attending the University of Salamanca. It was the best experience that I have ever had. I consider this town my home away from home. It has been many years since I have returned to Salamanca, but I always have such warm thoughts in my heart - the people, "my family", the wonderful old streets, and the Plaza Mayor. For anyone who is considering studying Spanish in another country, this would be the best place to choose. Not only does it have the oldest university in Spain, but the culture is so rich in it's town. It is something that I would do over again and again. Now that I am married and have children, I am looking forward to the day that they are old enough to visit the place that has stollen a piece of my heart.